Vincent Dance Theatre present the company’s first ever double-bill, featuring solos by two of the company’s best-loved Polish performers: Janusz Orlik and Aurora Lubos. Test Run overwhelms the senses in a blistering display of dance combined with exquisite live music, whilst Look At Me Now, Mummy is an intimate, funny and moving portrait of a woman lost in her own over-zealous imagination. 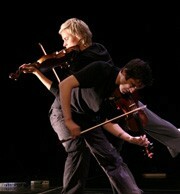 Both pieces feature the company’s trademark humour, passion and raw physicality, combined with great live music.